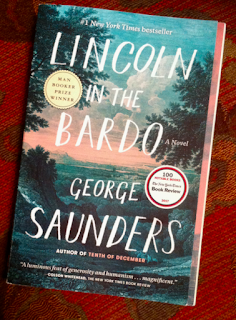 Reading, Writing and a Few Dog Stories: Lincoln in the Bardo - my surprise love. Recently I flew up north with an agenda that I knew might be stressful and difficult. The night before leaving I was half way through a book that I had not really engaged with and knew I'd finish in a day or two anyway and then have nothing to read. But I'd recently (bravely?) 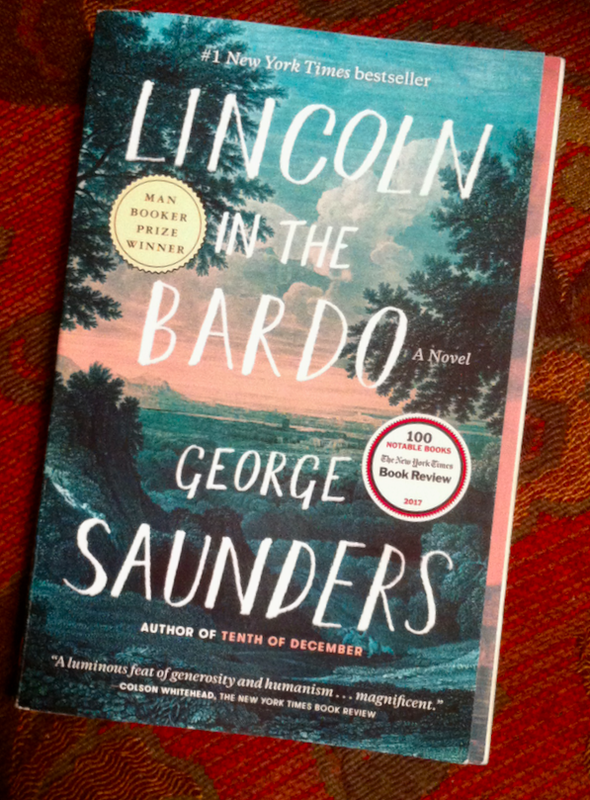 purchased George Saunders' Man Booker Prize winner Lincoln in the Bardo. I wasn't confident of embracing it, much less finishing it, on the basis of what some people had said in their reviews. So I took it with me on my trip north - only a week - on the assumption that if I had nothing else to read I might stick with it. Much to my surprise, I was hooked within a few pages. It is, without doubt, the strangest book I've ever read. Multiple voices, some historically authentic, others fictitious. We're left to work out which are which - which isn't difficult and nor does it matter. The small fact of the death of Abraham Lincoln's beloved boy, Willie, is set within the whole terrible drama of the American civil war, encompassing race, class and horrific tragedy. While Lincoln himself is crushed by grief and can't stay away from the crypt where Willie's body is taken, Willie himself is trapped between life and release and in the course of one night a cast of characters of all stripes wrestle over his fate and his soul. The story is, at different times, heart-wrenchingly sad, funny, ghastly, cruel, and shocking. My spoken French is pathetic. I turn to stone when someone babbles at me in French, expecting an answer. I can bumble my way around if I have to, an experience that leaves me feeling like I've just come out of major surgery. BUT my translation of written French isn't too bad. I read through text quickly and don't stop to agonise over unknown words. 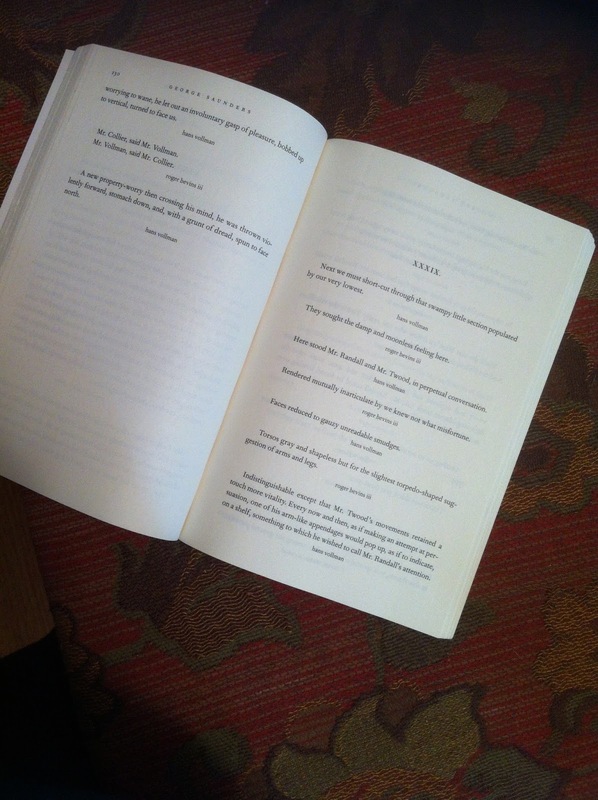 And this was a bit like how I read Lincoln. I read predominantly for meaning, and didn't always stop to process who was speaking. Sometimes of course I did but the two Greek Chorus kind of voices of hans coleman and roger bevins iii were easy to read just as conversation. "They buried Willie Lincoln on a day of great wind, that tore through the roofs of houses and slashed flags to ribbons." roger bevins iii speaks of the many soldiers lying dead and wounded in open fields with their "rain-soaked/blood-soaked/snow-crusted letters scattered about them." There are "geese above, clover below, the sound of one's own breath when winded. The way a moistness in the eye will blur a field of stars..."
It's a beautiful book, tender and dazzling, tantalising us with glimpses of a thousand different characters and their stories, all satelliting around the terrible grief of the President and the loss of his little boy. I think I'm going to read it again.